Marmots and ferrets are both small to medium-sized mammals that like to burrow and come in a variety of coat colors. They are quite distinct from each other in a variety of ways including their diet, body proportions and the noises that they make. They belong to separate scientific families. Marmots are rodents and belong to the scientific family called Sciuridae, which include squirrels. Marmots are also known as ground squirrels and include the groundhog and woodchuck. Ferrets are carnivorous mammals that belong to the family Mustelidae, which also includes weasels, skunks and otters. Marmots have a diet of grasses, lichens, mosses, roots, berries and flowers, while ferrets eat meat and enjoy whole small prey including the meat, organs, skin, bones and fur or feathers. Groundhogs typically measure 16 to 26 inches in length, including a 6-inch tail, and weigh 4 to 9 lbs. Ferrets are around 20 inches in length, including a 5-inch tail, and weigh 1 1/2 to 4 lbs. Although they are a similar in length, the ferret is much lighter than the marmot because they have different body shapes. Groundhogs and other marmots have a stocky thickset body with short powerful legs, a broad head and small ears close to the head. Ferrets are not thickset and are much more sinuous and slinky. They have a more tapered head and a lighter frame. Marmots tend to have one or more animals who act as lookouts when they are grazing. They warn others of dangers using high-pitched whistles. When they are fighting, hurt or caught they will squeal, and they also sometimes make low barking noises and a sound made through grinding their teeth. Ferrets can be quite vocal and make a chattering sound. They will scream if they are hurt or alarmed and will hiss at things they don’t like. They can make a barking noise, and when excited make a soft clucking noise known as dooking. Marmots are wild animals that live in natural habitats in much of the northern hemisphere, generally in alpine regions. They live in burrows and hibernate in winter. Ferrets have been domesticated for around 2,500 years and have been used by man for hunting rabbits and moles from their burrows. Marmots have been used as food throughout history, while ferrets have been used to help find food. 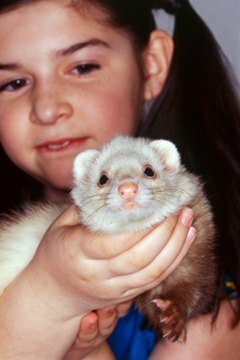 Some ferrets are still used for rabbiting today, although most are kept as pets.